The pleasure of creative block-building meets the satisfaction of puzzle-solving. One of the year's best games. What Is It? 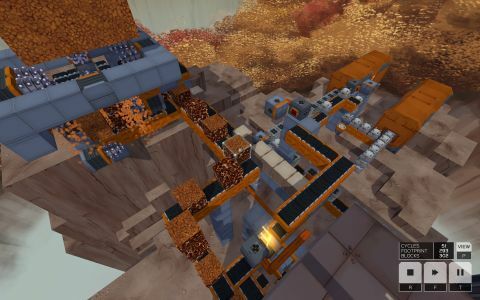 A block-based puzzle game about factory construction. When I wrote our review of the alpha version of Infinifactory back in February, I felt like I should give it a score. That version of the game was an accomplished puzzle game, my favourite in years, with a campaign you could see from start to finish. It felt done. Playing the finished version of Infinifactory today feels like playing the game and its first expansion pack. It's more done. Let's recap. Infinifactory is a creative puzzle game where you turn block-based factory components into complex machines. Each level has a different layout, a different schematic to match, and a different set of inputs that dispense various components and building materials at a fixed rate. It's your job to negotiate all of these different factors, a task that is 50% industrial design and 50% trainset construction. You are doing this in order to please your alien captors, giving the game a comic streak that treads the line between black comedy and outright slapstick. The sci-fi setting justifies both the freeform nature of the environments you build in (you'll spend a bunch of time constructing factories on asteroids) and also allows Infinifactory to show off a surprisingly pretty side, particularly in its later missions. It's not all conveyor belts and starscapes: there are dazzling nebulae, cyberpunk skylines, and alien forests too. You zip around by way of an always-on jetpack and manipulate blocks in much the same manner as Minecraft's creative mode. Every tool available to you behaves according to a consistent, heavily simplified physics system. Complexity arrives in the form of logic devices: sensors, blocks with different toggle states, and so on. These are introduced to you slowly, with puzzles dedicated to explaining each. Soon, the potential for creative combination skyrockets. Since its early access launch, Infinifactory has gained three mini-campaigns that follow the main story (I won't say much more about the context for these, to avoid spoilers.) Each centres around a set of new blocks that change the way you build in variously subtle and drastic ways. The laser is a variant on the block-destroying eviscerator with much longer range and, crucially, the ability to be toggled on and off. The counter is a sensor that activates after a user-specified number of blocks have passed by it. My favourite of the new set is the teleporter, which acts as an environmental modifier. Teleporters move one block at a time (or the player) between separate areas of the world. Their usefulness is offset by the need to reassemble whatever it is that you tried to teleport on the other side: building devices to sensibly feed constructions in and out of teleporters is a gratifying challenge. The genius of Infinifactory is not that it's a very well-designed puzzle game: it's that it makes you feel like a talented designer too. There's a tremendous satisfaction to watching a machine that you've slaved over diligently follow your orders. It's the videogame equivalent of those incredibly compulsive looping gifs of factory processes, but you made it—and the pride you experience in coming up with a solution feels 'earned' in a way that it does in few other games. It's appropriate, then, that Infinifactory allows you to output a gif of your creations at the touch of a button (these have been upgraded in a recent patch, too) and that, for those who want to take things further, there's the option to create and share user-generated puzzles via the Steam Workshop. It's nice to be able to finally give Infinifactory the outright recommendation it warranted earlier in the year. This is the most generous game Zachtronics has made, opening up SpaceChem's lofty problem-solving up to anybody who can place blocks without sacrificing too much intellectual headroom in the process. The best Infinifactory solutions blow my mind, but I'm happy with my own ones too. It's that accessibility that makes Infinifactory special: not only is it clever, but it shares its cleverness with the player.